Rangers boss Graeme Murty is reportedly keen on striking a deal for Russell Martin. The Scotland international defender has been told he can leave Norwich City on loan and former Canaries coach Murty is keen to bring Martin to Ibrox. Meanwhile, Rangers have also thrown out a £200,000 bid from Wigan for Josh Windass. Darren McGregor revealed ref Steven McLean admitted his assistant made an error by not awarding a goal in Wednesday’s derby but told the Hibs defender there was nothing he could do. “I spoke to the ref and he held his hands up and said: ‘we can’t change it now’,” recalled McGregor. Hearts are in talks with Wigan Athletic midfielder Jack Byrne as the English League One side step up their interest in winger Jamie Walker. Byrne is one of several signing targets and negotiations with Wigan about a January move have begun. Walker could go the other way for a fee in the region of £300,000. Dundee United midfielder Fraser Fyvie will miss the rest of the season after sustaining cruciate ligament damage in the Terrors’ win over Livingston. The former Hibs and Aberdeen star was forced off after challenging Steven Boyd in the 3-0 win. 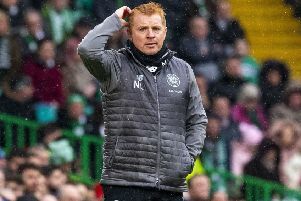 A Hearts fan provoked a furious backlash when he posted ‘It’s definitely time for Neil Lennon to start receiving bullets and bombs in the post again; after Wednesday’s derby. Cardiff have dropped their interest in Celtic winger Jonny Hayes after he broke his leg against Dundee. The ex-Aberdeen wideman was a target for the Bluebirds in the summer and it is understood they were planning to return with a £1m bid for Hayes. Celtic are said to have asked West Ham if they still want to sign Moussa Dembele. The Frenchman was a reported target for the Hammers in the summer but no bid emerged at the time.